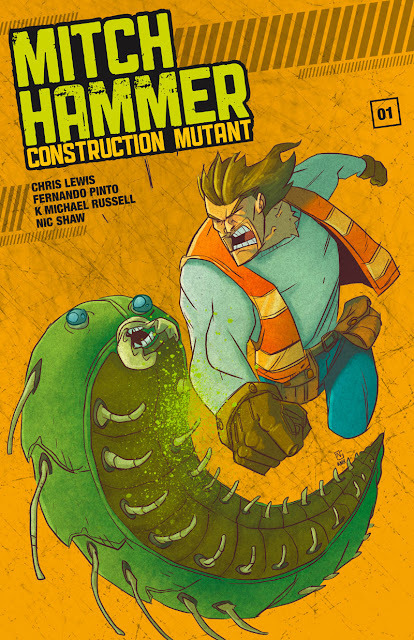 MITCH HAMMER #1 is 24-pages of construction worker vs. big monster action, available in digital form for ONLY ONE DOLLAR, or as an OVERSIZED XXL print edition! MITCH HAMMER issue #1 (of 3) introduces us to the titular construction worker, who wants to go home and have a beer after a long day of work. He’ll have to wait for his barley pop, though, when the local community college is attacked by C.L.O.T., the militant wing of the National Blood Clot Association. Together with his best buddy Jorge and the brilliant graduate student Katie, it’s up to Mitch to save the students from science gone wrong. Unless you're looking for a physical copy of the book. In that case we've got something extra special for you in the form of an XXL print edition! At a hefty 7.5 x 11 format (estimated), the print version of MITCH HAMMER is almost as big as the man himself. Not only will you be able to see the glorious artwork in super size, but you can use the comic to swat away any invasive mutant caterpillars that might be creepy crawling your way at this very moment. With this two-track approach - offering the pdf at the low low price of $1, while giving physical comics lovers the chance to order an XXL analogue version - we hope to get MITCH HAMMER into as many meaty hands as possible. And every penny raised will go towards producing issue #2. The future of blue-collar comics has never looked brighter! Did I mention that MITCH HAMMER #1 is completely finished? We can start sending out rewards as soon as the campaign ends! Which is good because I can’t wait for you to see the results of this insanely-talented creative team. Fernando Pinto draws lovely caterpillars, both the motorized and mutant-ized variations. K. Michael Russell brings an old school vibe with some tasty colors. Nic J. Shaw, aka Ironbark, makes my script look good with his bold letters. And with Dan Hill edits, and a Chris Kosek-designed cover that’s going to knock your socks off, this is the muscular action book you’ve been waiting for. As I said, the book is already finished, so I don’t see any risks here. Other than the health risk associated with losing your heart to one of those safety vest-wearing, chest hair-spouting, dangerous but lovable construction worker types!